Kolkata, December 1, 2018: In what could be easily called one of the most electric encounters of the Hero I-League this season, Kolkata footballing giants Mohun Bagan shared spoils from a 1-1 draw with table-toppers of the Hero I-League, Chennai City FC. Hero of the Match Sony Norde’s individual brilliance came to the forefront once again when he drew the first blood for the hosts, through an extremely well-crafted goal in the 50th minute while Chennai City FC made no mistake in showcasing their class as well through an exquisite goal from their Spanish midfielder Nestor Jesus in the 81st minute. The southerners, who are the runaway leaders this season, were playing in Orange while Kolkata Giants Mohun Bagan were in their traditional Maroon and Green Stripes. Head Coach Sankarlal Chakraborty made two bold changes in the form of Egyptian midfielder Omar Elhussieny in place of Cameroonian forward Dipanda Dicka and bolstering the defence line by bringing in Lalchhawnkima sitting Dalraj Singh out. The game began with the hosts visibly pressing hard but the lack of a good finish eluded them from scoring. What was interesting to see is that the new combination of Elhussieny in the midfield along with Sony Norde and Pintu Mahata with Henry Kisekka as the lone striker seemed working as they made a few threatening and close attempts to score. Full marks to Chennai City’s Spanish Goal Keeper Nauzet Santana who ensured that the hosts couldn’t breach his level to find the back of the net. Chennai, on the other hand, were unable to break into the organised defensive line of Mohun Bagan and that did frustrate them. This was followed by an unusual early change made by the visiting Coach Akabar Nawaz who brought in Mashoor Shereef in place of Romario Jesuraj in the 31st minute. This change suddenly increased the pace of the game as Mashoor, with his height, combined well with the Spanish trio of Sandro, Nestor and Manzi to make some interesting moves inside Mohun Bagan’s box, but couldn’t find the finishing touch to manage a lead. The high paced and entertaining first half came to an end with the scoreboard reading goalless. The second half began with Chennai City FC again pressing but the Mohun Bagan defence was too tight and organised to let them in any form. It was Mohun Bagan who started the actual invasion with Sony Norde leading the mantle when his first attempt was beautifully saved by Chennai City’s Santana. 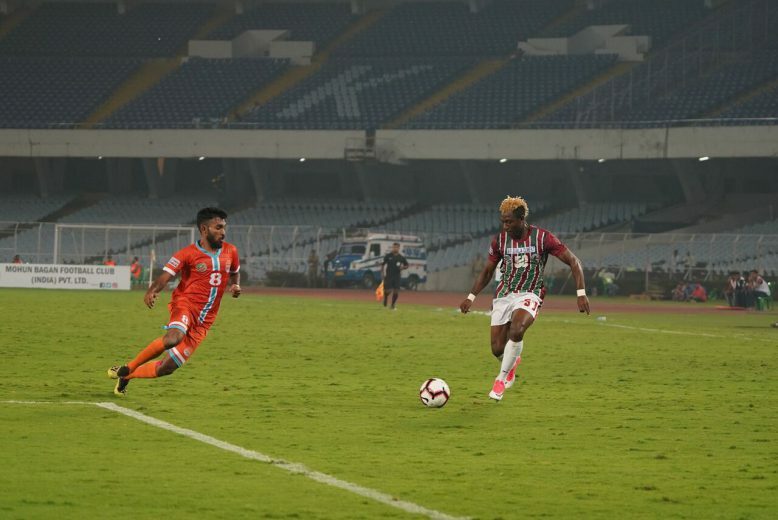 A couple of minutes later, Sony Norde made no mistake when he received a pass from Kisekka a little ahead of the centre line. Norde made a beautiful run to the left of the Chennai box to cut back beating the Chennai defenders. In the process to position himself for an angular shot which curled in keeping Goalkeeper Nauzet Santana stranded, gave Mohun Bagan a much needed and deserving lead in the game. Chennai City FC, thereafter, made numerous attempts to equalise but could not find the back of the net until the 81st minute when a long ball from Eslava was collected by Nestor to make no mistake in capitalising on the first defensive lapse by the Mariners. The game suddenly changed gears as Chennai City came back on the attack with added force. In the final 10 minutes, Chennai City came close to scoring at least 4 times taking advantage of the breaking defence line of Mohun Bagan but could not find the back of the net until the final whistle. In the 90th minute, a stunner of a shot from Sandro hit the crossbar keeping the visitors’ hope of winning both the duels in Kolkata at bay. The highly exciting and entertaining game saw Chennai City FC play with 62% possession as opposed to Mohun Bagan’s 38%. Mohun Bagan’s next match is the most awaited clash that any football lover in this country waits to experience. They are now set to clash against arch-rivals Quess East Bengal in the very famous Kolkata-Derby on 16th December while Chennai City FC will fly to Panchkula to face defending Champions Minerva Punjab FC on the same day.